Given that the spiciest thing I was fed as a kid was Chinese takeaways….and considering chili can burn your face off like flaming magma…and also taking into account that the normalisation of ready-made Thai curry pastes and the like happened well after my formative years…it’s unsurprising that it’s only in the last few years that I’ve got into hot spicy food. Spooning chillies! Is what I thought when I uploaded this photo to the computer. That third one’s really getting into it. Giving the middle one a right old affectionate nuzzle. 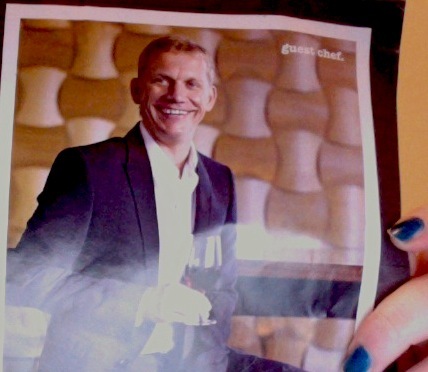 Anonymous, smiling “guest chef”: thank you. What is Nahm Jim? A flavour-ly balanced Thai sauce or dressing, which in this recipe harnesses the bright, colourful flavours of red chilli, coriander and lime, and rides them like a capable mule into the salty intensity of fish sauce and caramel fudge sweetness of palm sugar. It all becomes quite the drinkable finished product, which you can pour over things, mix into things, or use it like I did, to marinate things. 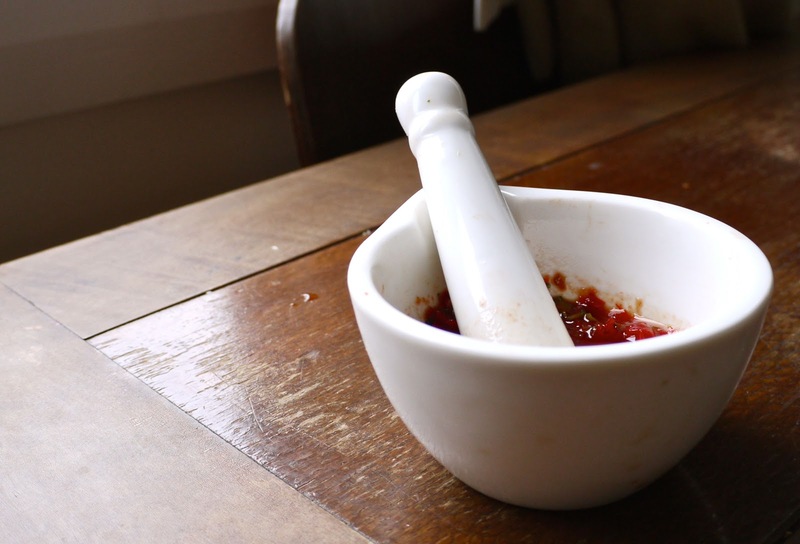 Using a mortar and pestle, bash the chili, garlic, coriander and 1 tsp salt to a paste. This really didn’t happen for me, it was more just bashed up stuff, but it still worked. Use a food processor or just chop everything superfine by hand if you don’t have the equipment. Work in the palm sugar, then add the fish sauce and lime juice. Check the flavour balance, add more of something if necessary and refrigerate in an airtight container. So a chili’s heat depends a lot on its size and colour. Big = mild, and red is milder than green, and therefore if you’re just getting into it, use the biggest red ones you can find, make sure all the heat-packing seeds are scraped out of its lengthy belly, and don’t whatever you do touch your face after dealing with them. I rubbed my nose after chopping up these ones and it was burning away for ages. It was a cold night, so it actually worked in my favour, but in the eyes is not so fun. That said, I wussed out of using the small chilli and upped the big chilli quantity – the sauce was gorgeous, don’t get me wrong – but in the end it wasn’t quite hot enough, so more fool me. Who just puts noodles on the table? This fool. I had a very appealing idea for marinating chicken in a mixture of this Nahm Jim and coconut milk, but a look at our bank balance meant it wasn’t really a chicken-buying kind of week. Instead I turned to that full-of-potential and megacheap foodstuff that is tofu, to make Coconut Nahm Jim Tofu and Rice Noodles. My method went like so: slice up one block of firm tofu as you please (I chopped it into pretty diamond shapes which really just look like crooked squares, defeating the purpose completely) and place it in a small container (like a leftover plastic takeout one) and spoon over about half of your Nahm Jim. Or indeed any chilli sauce you like and have handy. Leave for as long as possible – I marinated mine for over 24 hours, on recommendation of Ally – and then about an hour before you cook it, like say when you come home from work, tip in half a can of coconut milk and let it marinate further. Heat up a little oil in a frying pan, spoon the tofu out of the container and into the pan, and let it sizzle away. I like my tofu to be either crunchily crisp, or super tender, and think this recipe suits it being on the tender side, but you do as you please. The residual coconut milk will bubble up and evaporate, and it’ll smell amazing. Remove from heat when you’re satisfied with the tofu’s level of cooked-ness. Meanwhile cook up some rice noodles, drain them, tip in any leftover marinade from the container, a little more coconut milk from the rest in the can, and some salt. Serve drizzled with sesame oil, the remaining Nahm Jim, coriander and sesame seeds. I love tofu heaps and this may or may not convince you to also, but it’s a pretty simple dinner that looks and tastes good. Not to mention, doesn’t cost a whole lot. Tofu is so cheap and ridiculously filling, making it a pal to our bank balance. The Nahm Jim and coconut really soaks into its spongy surface during its marinading stage, and the sugars in both elements smell gorgeous when they hit the hot pan and start caramelising. 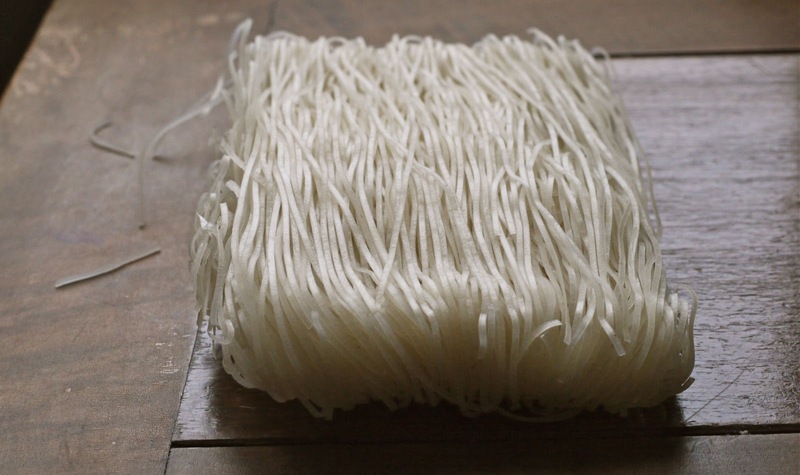 While it’s perfect straight from the hot element, if you let it sit for a while the slippery rice noodles absorb the coconut milk and become even more luscious and silky-textured. Mint would be a nice substitute for coriander if you’ve got it – nothing like a bit of green sprinklage to make a plate of food look more professional. Oh, and you could feel free to spoon the uncooked tofu into a salad or something straight from the marinade – it tastes amazing as is. I’m a very determined and ambitious person. Not that I’m used to things going my way. I am in fact extremely used to things going decidedly not my way. But in order to help me help myself to get more things going my way (if that makes sense) I’ve made a big to-do list, inspired by three friends, all outstanding in the field of excellence (Jo, Kim and Kate) who have all previously created their own. It’s all very well and good to be determined and ambitious, but it’s very very well and good to write stuff down so I don’t forget things, and so I can be accountable to my own brain, which flings around ideas like a pinball machine. I’ve already started writing it (and you can read my list here) and I’ve got till the end of Sunday to finalise it, and from there, till June 30 2012 to complete the tasks. I’m looking for some more things to add to it, so feel free to make suggestions (I’m talking kinda broad thematic things, not like, say, “Oi Peter Gallagher, resolve to pluck your eyebrows!” because that’s just not helpful.) Yes, I’m pretty serious when I say “get a book deal”, I don’t want this to sound like the tagline to a Justin Bieber movie but I dream bigtime big and I think I can make all these things happen, if I work at it. If I could keep our room tidy for a month though, that would honestly (I can’t emphasise my hopelessness) be almost as much of an achievement. And now that it’s written down on this list, I am going to make it happen. Hopefully. Wait, no! DEFINITELY. What would Leslie Knope Do? Is what I’ll remind myself when things look uncertain. Oh yeah, and Snacks the Goldfish is now nearly two weeks into her new life with us and thriving. I like to amuse her/annoy Tim by singing at her whenever I get home from work and walk in the room. I can tell you with certainty that yelling “who let the dogs out!” and then pointing expectantly will not elicit a response of “who, who, who, who” from either Snacks or Tim. Title via: the always sadly-late Aaliyah, shortlived R’n’B perfection, with Hot Like Fire. Who do you love? I love Bo Diddley, you blazer of trails and creater of amazing guitar rhythms. Nature Boy, Nat King Cole. We found a record of his at the Waiuku Bookfair that turned out to be the same one my grandparents on my dad’s side used to blast all the time. Nice to be able to remember them while listening to his beautiful, restrained singing. Makes my eyes water just looking at those spooning chillies. 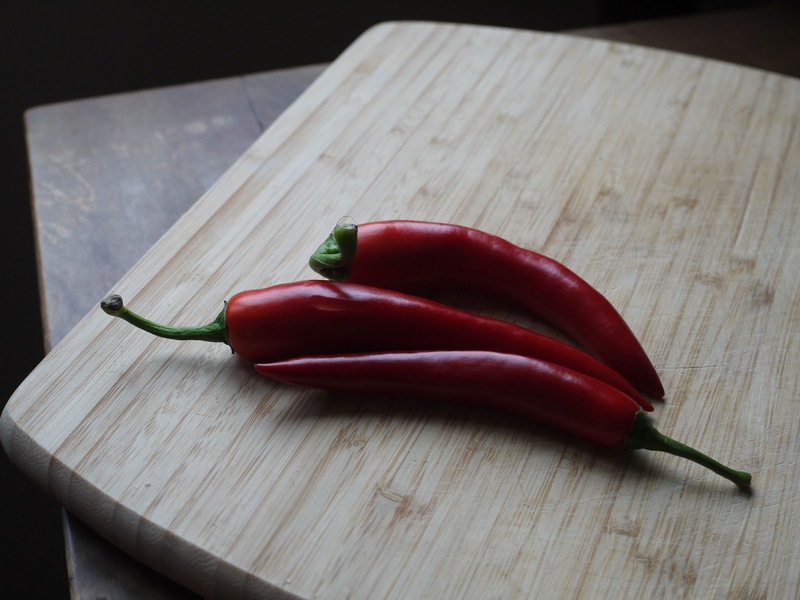 I just can't work out what there is to like about chillies… I have tried, unsuccessfully, many times. Nope, just can't do it. But, all hail to those who can! Chillies! Yum. Until this year I was hopeless at eating anything with even the smallest amount of spice in it. Then all of a sudden I could. Just like when I learned to drink red wine and gin. Now I add chilli flakes to *everything*. Still the papaya salad in Laos defeated me more than once. Way. Too. Hot. The heat is actually in the membranes that hold the seeds, not the seeds themselves! So if you are really serious about reducing the heat, you need to make sure you scrape those away. I have a Longrain cookbook – amazing complex flavours. I must dig it out again! I've always kind of liked spicy food but I too have been pushing the boat out this year… I've been trying tiny chillies that a little old lady at my market sells. Be bold! I love Thai cooking but haven't made this before. Looks gorgeous! And just right for this time of year with lovely fresh crisp flavours coming back in! I dind't know Nahm Jim, but I make something called Nam Prik :-). 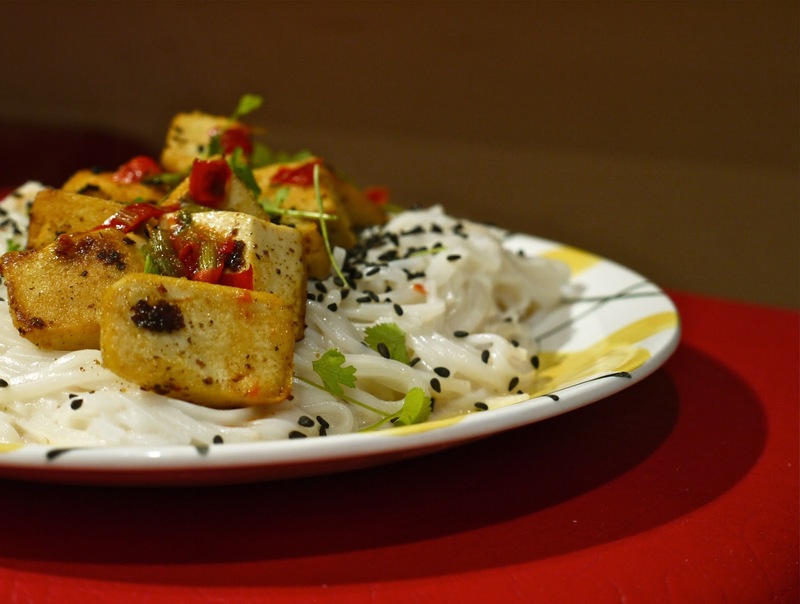 Love the recipe, great for tofu, and Thai food is high up in my list of fav. Great photos! This sounds so flavorful and yummy! This looks delicious and I love that my Salient column got a mention in your wonderful food blog! I'm now craving a tofu stir-fry and it's only 9am! Yum! Love chillies & love using lots of fish sauce. Must hunt down some red chillies this weekend that are not ridiculously priced to make a batch of this! I too have been working on my spice tolerance in recent years, with this past seven or eight months turning my formerly linearly increasing spice-like more into a power function of in-your-face spice (for me). Spice = math. I wasn't familiar with nahm jim, but I bought a bottle of sweet chilli sauce a year ago last May that was the size of a small baby. Maybe a bit larger? I'm proud to report that we finished that bottle up last month. Those chillis look ALL kinds of awesome, have tended to stay away from tofu, but this makes me question why. Can you please make this for your next tutorial?